If you logged on to Instagram last night, you know it was raining photos and videos from Sonam Kapoor and Anand Ahuja's Mehendi and Sangeet! And we love nothing more than a celebrity wedding. They somehow set the bar for all our future makeup looks. We managed to get a hold of Sonam's sangeet look last night and it was all white and gold... just like the rest of her bridal party! Her hair and makeup was done by Sonam's friend and celebrity makeup artist Namrata Soni. 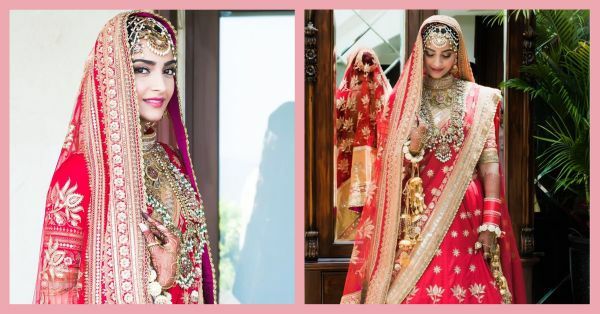 Sonam Kapoor and Anand Ahuja are getting married today and the first photos from their Anand Karaj are out! Stepping away from her usual pastels and neutrals, Sonam embraced the traditional red. The jewellery, the hair and makeup, her entire vibe is nothing short of a queen! Let's look at a quick breakdown of her hair and makeup, shall we? Those glossy pink lips and slightly smoked out eyes and giving us major makeup goals TBH. And did you notice her hair? The traditional bun and some flowers! Sonam's makeup is reminiscent of a blushing bride. As expected, the look is timeless. Her makeup once again focused on her best features, her eyes! We LOVE the soft pink smokey eye paired with that bold eyeliner, long lashes and brows on absolute fleek! Since the lehenga is red, a matte lipstick would look too overpowering on the face so glossy rose-tinted lips were the best bet! And of course, let's not forget about blush? No bridal makeup look is complete without those blushing cheeks! Since the dupatta is pretty heavy and has a lot of work, Sonam's hair was simple and traditional. A simple bun with blooming flowers added the perfect balance. 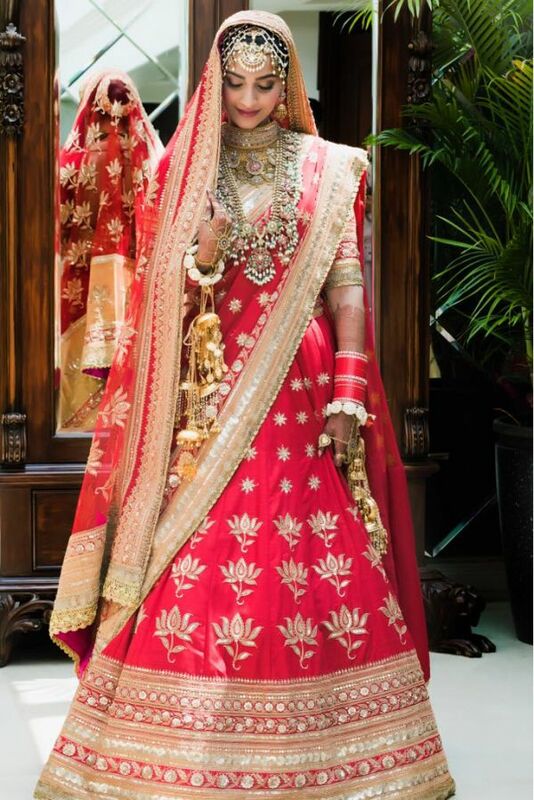 A shoutout to all you brides-to-be, keep an eye on this post for more of Sonam Kapoor's bridal hair and makeup look! Stay on POPxo.com, Sonam and Anand's reception is this evening and we'll keep you posted as more photos emerge from #SonamKiShaadi!